After several days of lounging by the pool at our fancy hotel in Colombo, we decided to up the adventure. The verdict: a day trip to Galle, the city on the southwest coast of Sri Lanka known for its colonial history and architecture plus natural harbour. One German-speaking Sri Lankan en route frowned when we told him our destination, sharing that it is not particularly schön and filled with Russian tourists. He advised us, as every Sri Lankan seemed to do during our trip, to go to Kandy. But it was worth the journey to Galle – and in many ways, for the journey itself. It was two and a half hours by train there, slightly less on the journey back. At this time, we were staying at The Galle Face Hotel in Colombo, the most luxurious choice of our twelve-night trip – and quite possibly our favourite. Think constantly opened doors, people catering to your every wish, and the height of air-conditioned, polished marble cleanliness. All very different from a packed railway carriage. That was Iain's idea of fun, and at first I said there was no way I'd join him. Then, as Iain knew I would, I changed my mind last-minute and told him and his Dad I'd go too. Breakfast of champions at Galle Face Hotel, Colombo. The morning of our train adventure, we waved down a tuk-tuk to get to Fort Railway Station in Colombo for eight o'clock in the morning, and were in the queue for tickets a good half hour before our train was designated to leave (just like the tourist advice room at the station had advised). But the queue was a long one – perhaps because it was the Sinhalese New Year holiday period, perhaps because it usually is busy at 8 am on a Sunday, or maybe just both. We saw the train arrive at the platform when we were a good 5-10 minutes wait from the front of the queue and, by the time we had bought our (ridiculously cheap) tickets and crossed the bridge to the platform, the train was packed. Photo by Christine Stepek. 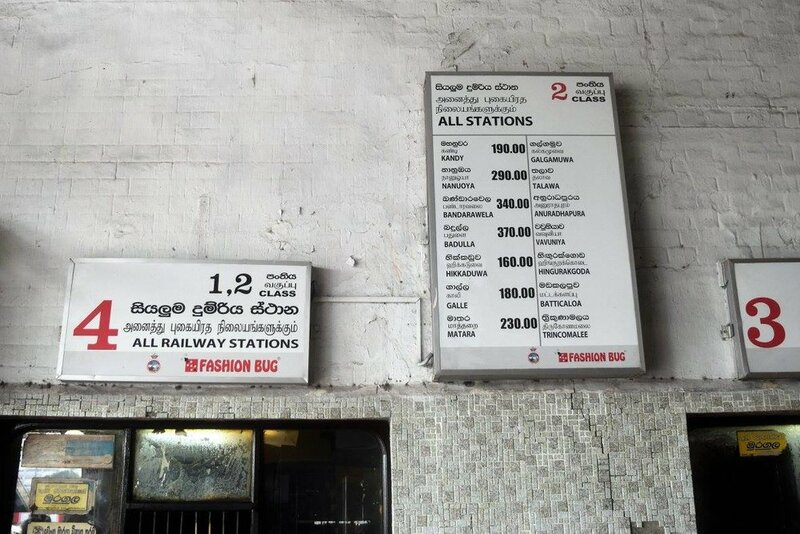 That's 180 rupees for the two and a half hours to Galle, or £0.92. In the remaining fifteen or so minutes before the train left (slightly later than scheduled), more people packed in. But once the train left and air started circulating through the open doors and windows, we started to relax. We were standing for the majority of the journey, but we were pretty lucky really. We were by the breezy open door, I had a wall to lean against, and we only had smallish day bags with us for luggage. And we had the view. The train was right next to the Indian Ocean, a view which is one hand very beautiful, and on the other, very haunting if you know its history (which we didn't until a few days later). Over 1,700 people lost their lives while travelling on this route in 2004 when the tsunami hit, making it the largest single rail disaster in history. Compared to our early morning train to Galle, the journey back to Colombo at 3:30 pm was much quieter and we easily got seats. We watched from our window as boys dangled from the doors, snatching leaves from passing trees, and saw people passing through the carriages with drinks, fried snacks and local foods, as well as one with a flute that woke us from our naps. If you want to experience a rawer side of Sri Lanka and talk to some of its people as they go about their day, consider a trip by train. If you want to dangle out of a train door but your national railway service at home doesn't let you, definitely take the train. The Colombo-Galle route is a bit of a commitment at over two hours each way, but the views are beautiful. You might not get a seat, but you may well remember the details of the journey more than you remember your hotel.